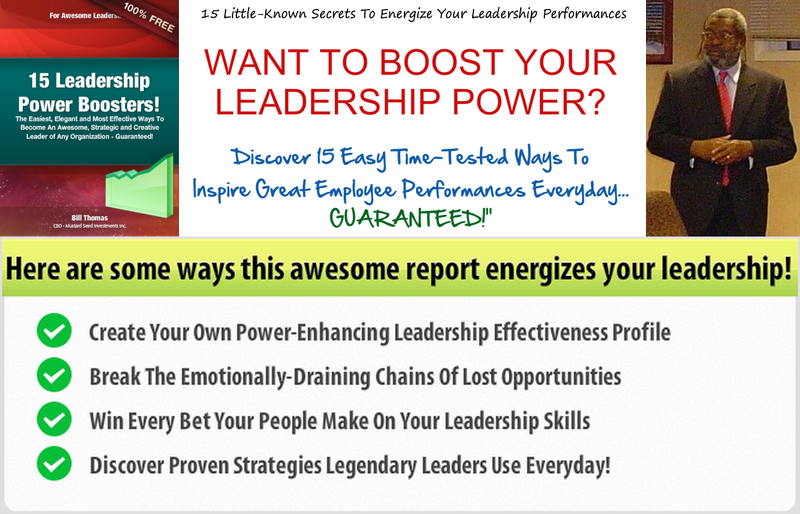 ATTENTION: Leaders Who Want Inspired Performance Improvements And Better Results! More Educational Resources To Your Inbox! Plus, Your Tools, Reports, Articles, Videos, Special Discount Offers & Program Alerts! New Discoveries And Best Ideas With Others! Your training supplier MUST give you a risk-free, iron-clad, performance-based guarantee - you should always know how confident your training providers are about their ability to help improve your leadership skills - if their Program doesn't work for you, you should get 100% of your money back! "Visual (looking at and reading through diagrams, papers, slides), Kinesthetic (actively working with forms, exercises, interactive maps, etc.) and Aural (intently listening to recordings, lectures, music)." Your lessons must empower you to master new subjects using various learning techniques, such as, employing "spaced repetition" - a method which provides learners with an exposure to the same message for a few minutes every day will boost their understanding of the subject matter in a short period of time. Your educational experience must give you ample opportunities to play, work and experiment with the concepts, principles and procedures of leadership. That way, you can practice, adapt, refine and master your newly-acquired skills - you'll want to call our "best-in-class" approach, "My Experiential Power Learning System!" . Your growth and development needs a focused, disciplined program of progress assessments and follow-up support - your Program must provide 1-2 hours of intensive skills strengthening, behavioral reinforcing activities every week (our Awesome Leadership Power Tutorials Programs give you up to 8 hours of monthly, "1-on-1", performance improvement coaching, tutoring and mentoring sessions). You're a unique, one-of-a-kind individual, aren't you? Your executive, management, supervisory, professional or entrepreneurial challenges are different from every other team or project leader, business manager, specialist and administrator in the world. Your training program provider must spend extra time on satisfying your toughest demands, you must be able to invest in your most profitable opportunities and pay close attention to working on your highest pay-off results. Because the complexity of today's challenges are your reality, you deserve a comprehensive, competent and compatible series of in-depth, insightful, incredibly-robust, proficiency-strengthening educational experiences - you deserve your very own custom-designed Awesome Leadership Excellence Program! Be Sure To Grab Your Resources Now! I Invite You To Join My Mailing List! This Higher Level Leadership Training? Join Our Imagination Age Leadership Program!